A savant and a great saint of the spiritual tradition of Yoga & Ayurveda in India, Acharya Balkrishna, is involved in rennovation, propagation and establishment of Ayurveda, authentically Acharyaji is a representative of a saintly tradition in whom the knowledge of Maharishi Charaka, Sushruta, Dhanvantari and all other saints of Ayurvedic tradition is completely and intimately compounded. Acharya Balkrlshna is a great scholar under whose guidance Ayurvedic treatments and Research has been globally established gloriously, with no government aid. He has 41 research papers in his name which have been published under his guidance in several National and International journals and magazines. Acharya Balkrishna has received innumerous awards like "Vanaushadhipandit," "Sugyanshri," etc. for his contributions in the field of Yoga & Ayurveda. Famous magazines like "India Today" (Nov 2009) and "Outlook" (lan 20I0) counts him among the ten versatile and dynamic young men of India. He has authored many books on Yoga & Ayurveda and has edited many scriptures from unpublished Ayurvedic manuscripts. A famous scripture on Ayurvedic treatment 'Aushad Darshan', whose more than 8 million copies have been sold, is also a unique creation by him. 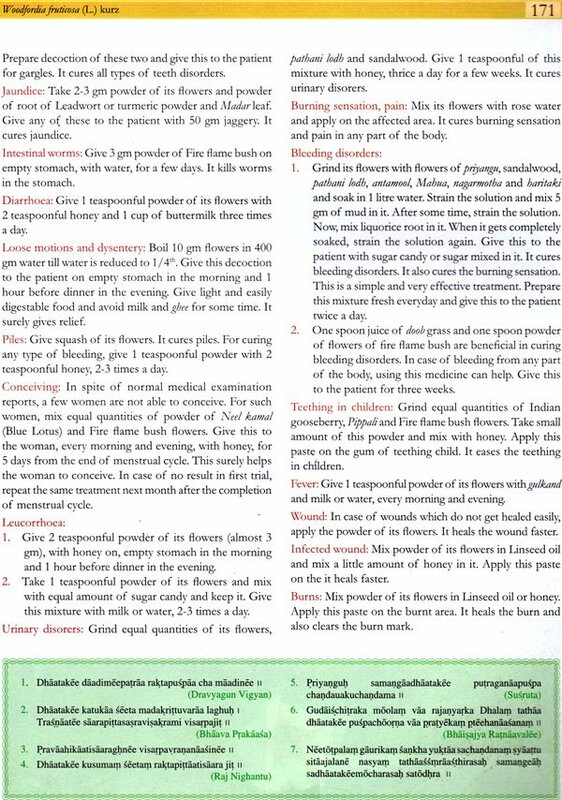 With the mettle of Acharyaji, the first dimension of his dream project of the names of the medicinal plants of the entire world in the form of the world's biggest web portal as “www.worldherbalglossary.com” and a book named "Glossary of World Herbal Plants" is going to be published shortly. As well as his dream work "World Herbal Encyclopedia" is under publication. Acharyaji's famous Television program on several channels has revived the interest in using plants for medicinal purposes and also the interest in Ayurveda, globaly. He is a great visionary, highly ascetic, energetic, diligent, simple, easy-going and a versatile personality with multi-dimensional skills. He is constantly engaged in the service of mankind. World's largest food processing unit, 'Patanjali Food & Herbal Park' is the result of his innovative vision. He is the inspiration & designer behind the construction of huge and high!)' modernized DivYa Pharmacy and Patanjali Ayurveda Ltd. Formation of Patanjali Bio-Research Institute (PBRI) aiming for the conservation of Nature & Environment and developement of organic farming for pollution-free soil, is also the materialization of his ideology. He is an associate of Swami Ramdev, who is one among himself and the chief architect of all the organizations under Pataniali Yogpeeth & Divya Yog Mandir. Establishment of world-class, well-organized, well-eouipped Hospitals, Yog Bhavan, Laboratories and other huge infrastructures are examples of his visionary power and initiative. Besides, he is the founder of Patanjali University Patanjall Ayurveda College, Acharyakulam Educational Institute and Vaidik Gurukulam. He is one of the renowned and pioneer Indian in the field of Ayurvedic Science and a source of inspiration for all. "Secrets of Indian Herbs for Healthy Living" is a very useful book that has attained great popularity and has been appreciated by millions of people. The book has benefitted many readers and has helped a number of people to achieve good health. The book has helped people to identify medicinal plants in their nearby vicinity and has also encouraged people in the conservation of these medicinal plants. It has increased mass awareness on the use of medicinal plants. On demand of our readers, very shortly we will release this book in a new format. Now this book will be available in three volumes with complete detail of about 500 medicinal plants. Many new medicinal plants will be incorporated with more vibrant pictures and additional authentic information in this revised version of the book. Many rare plants of valuable medici- nal use that were still untouched by herbalists have been identified by the author and will be incorporated in the book. The book describes about 700 curable and incurable diseases. and treatment methodology according to the specific disease. The medicinal uses of each plant and different medicinal recipes have been elaborated. Moreover, specific descriptions of classics medicinal uses, self-experienced uses, traditional uses and folk remedies as used by the people of different comrnunity through out the world will be introduced as far as possible. Besides. 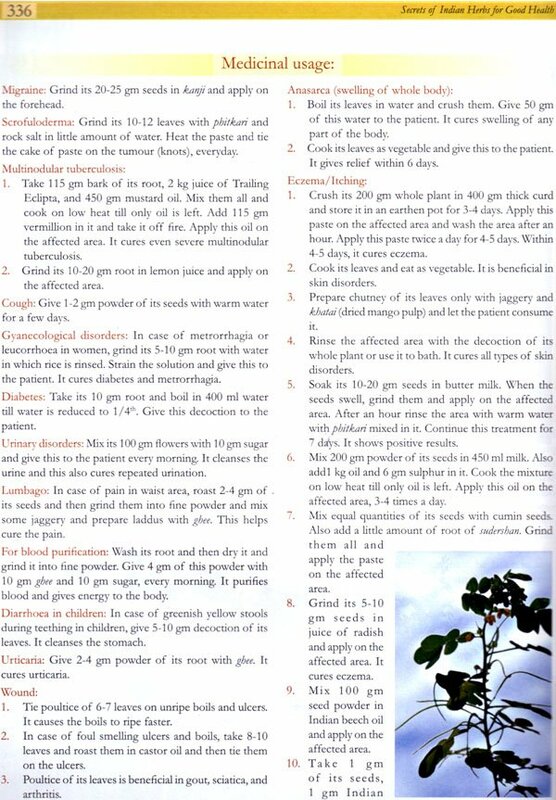 tr book also contain detailed description of medicinal plants, the pharmacological studies and therapeutic properties, toxicity of the plant, botanical description of the plant with vibrant photographs to make the identification of plant easy. 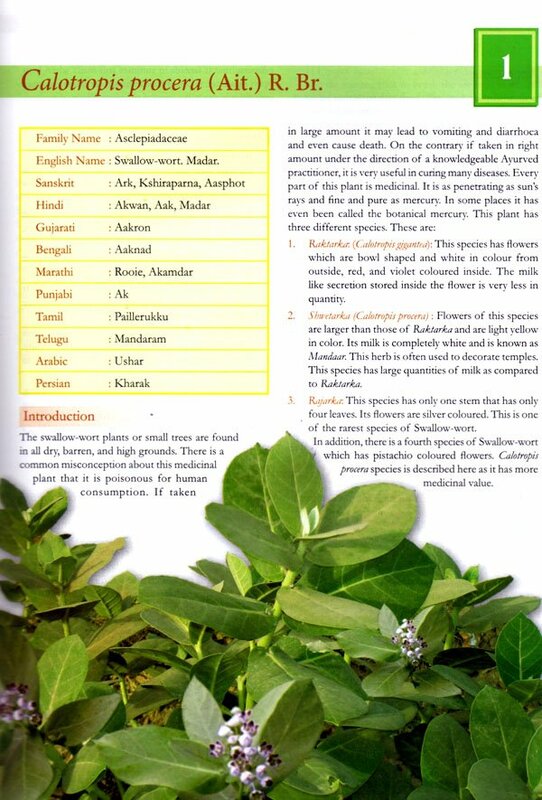 Vernacular names of each plant have been mentioned for our readers from different regions across the globe. Lack of physical labour, mental stress, negative thinking, imbalanced lifestyle, unnatural diets and dilution of life-sustaining natural processes has led to the scary rise of cancer, heart problems, diabetes, high blood pressure and obesity all over the world. Nature sustains life. It has cure for all kind of diseases, afflictions mankind is grappling with. In the absence of much integrated knowledge available about these natural remedies, people are unable to make good use of the herbal treasure India is endowed with. Honourable Acharya Balkrishnaji has worked hard over the years travelling into the deep jungles, mountain ranges and tribal areas of India and also abroad, collecting and collating information about many of these herbs, including their photographs and knowledge of their medicinal uses. 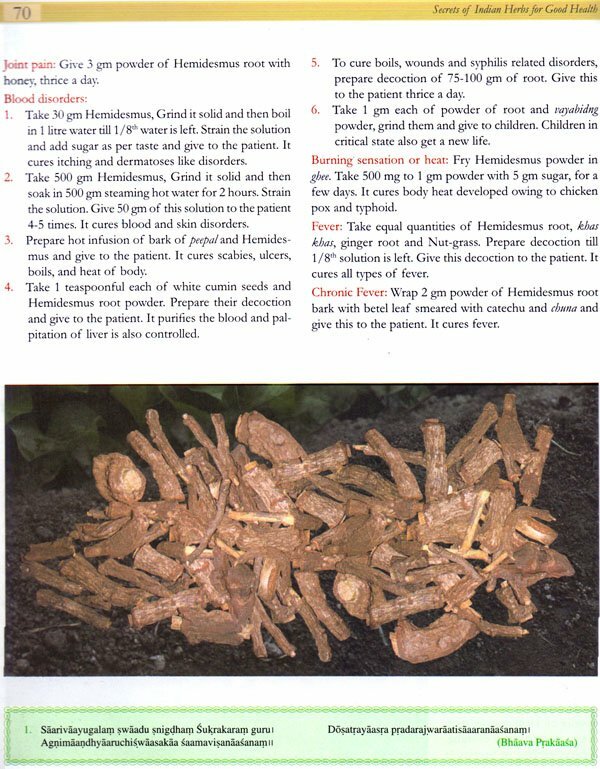 Secrets of Indian Herbs — For Good Health, based on research and experience-based traditional knowledge of herbs and their medicinal usage, shall prove to be a significant contribution towards the wellbeing of the humanity at large. It is a major work making knowledge of rare herbs easily accessible to all. My blessings are with the Ayurved exponent and scholar, Acharya Balkrishnaji. I thank him and applaud him for tireless and exemplary work he has done over the years for the promotion and preservation of Ayurved and Vedic traditions. In India the knowledge of medicinal plants has been continuously passed on through generations right from the Vedic period. The earliest and the main source of Avurved is Atharvaveda. In the ancient days the sages used to live in gurukuls (traditional schools of that era) established in secluded areas in forests. They routinely investigated and used medicinal plants. Their collaborators were inhabitants of nearby villages tending herds in the forests, who also collected fresh herbs. The medicines prepared from these herbs were used for treating people. The results were miraculous because the herbs were pure and fresh collected only after confirming their identity in consultation with the sages. The people were impressed so much that in course of time Ayurved developed and grew into the first medical system due to the untiring efforts of great minds like Dhanavantari, Charak, and Sushrut. It soon progressed to its peak form. It is not hard to believe that at that time there was no comparable system anywhere else. There is enough evidence from the Vedic literature and writings of Sushrut, the ancient practitioner of surgery, that the system had even developed artificial limbs. From India this medical system spread into the neighbouring countries — Tibet, China, Sri Lanka, Myanmar, and also to Islamic countries further West. With time and circumstances it underwent and imbibed many changes and advanced. The impact of Ayurved on the public mind in India was so profound that even under Islamic and British rule people retained their faith in it and it was widely practiced inspite of the negative attitude of the rulers. People in remote areas of the country depended solely on medicinal herbs for treating diseases because the Greek (Yunani) and Allopathic medicines were not available. 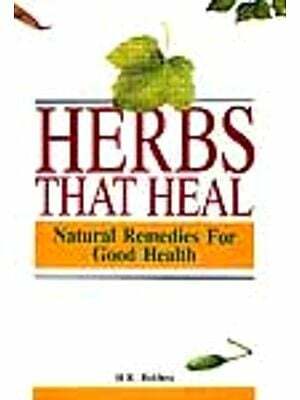 Even today people in remote villages and the tribals in far-flung areas have great faith in the effectiveness of the medicinal herbs provided by nature. Rich and vast traditional experience and knowledge of herbs is still available in villages and tribal areas, but not much consolidated effort has been made to preserve and disseminate this valuable information. On the other hand it is becoming quite clear that people are not convinced about the efficacy of allopathic medicines which provide quick relief but also produce other undesirable effects leading to new problems. Medicinal herbs do not have such side effects. In addition the cost of the treatment and medicines is constantly increasing and is burdensome. People are also getting frustrated by the inordinate delays in getting proper treatment and with the callous behaviour of the doctors in some cases. Ayurvedic treatment is relatively inexpensive especially for common diseases like cold, cough, headache, stomach and skin disorders there can be treated with easily available medicinal herbs. Therefore a thorough knowledge of the herbs and of the methods of their use becomes all the more important. The present book provides information about the medicinal use of commonly available herbs in a simple and easy to understand language. It gives step by step instructions for using them, which should he followed depending on die nature of the disease and in consultation with a knowledgeable Ayurved practitioner. 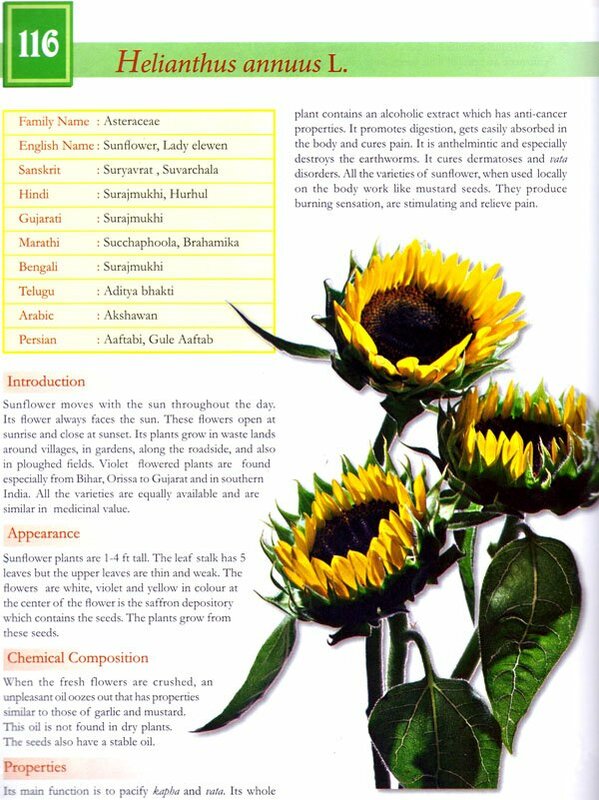 The book gives the names of the herbs in different languages along with Aurvedic description, chemical composition, properties, medicinal uses and their coloured photographs. Where possible, we have also included shiokas pertaining to properties and uses of a particular herb as found in ancient Ayurvedic texts. The main drawback in producing this type of book is that it becomes very difficult to identify the herb. If a herb is found only in a specific location, the only way to get it is through a dealer. In such cases it is important to see the parts of the plant that is used for medicine. To help the reader identify these parts, pictures of the specific parts of the plant are also given. The doses to be taken are also given wherever possible. If this information is not given, the Ayurvedic physician should be consulted before starting medication. Many herbs are available in different varieties, in which case pictures of all plant species are given. The decision for bringing out this book was made six years ago but the busy schedule and a desire to come up with an authoritative and visually appealing hook delayed the completion. Still that desire is not completely fulfilled and we will keep striving towards that goal. ‘While material from ancient scriptures has been used in the preparation of the book, inputs from modern day practitioners have also been incorporated for which we are grateful. Through this hook our aim is to make people aware of important Ayurvedic herbs and their uses. To facilitate identification, we have tried our best to give photographs of these herbs and their species as they appear in different seasons. ‘We have also given photographs of dry form of herbs as they are sold in the market so a layperson can easily identify them. For the English edition, we have revised and reworked the contents and have included many new pictures. I thank Sumegha Agarwal, Dr Kaushal Kumar and Priyata Raghavan for their dedicated efforts towards finalsing this edition. They have my best wishes and blessings. It is our sincere hope that the book will help in making the general public more conscious of Ayurved and thereby increasing the interest in learning about and using the medicinal herbs. It is quite possible that knowledgeable persons will find some mistakes in the book. ‘We will appreciate the feedback and suggestions. We will try to incorporate those in subsequent editions.